Morphology of trout cardiomyocytes. Confocal microscopy images showing the relatively simple morphology of trout cardiomyocytes. 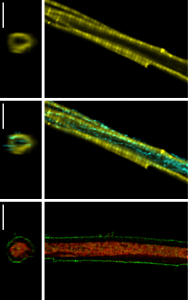 The right image shows one image from a confocal z-stack and the left shows re-constructed cross section. 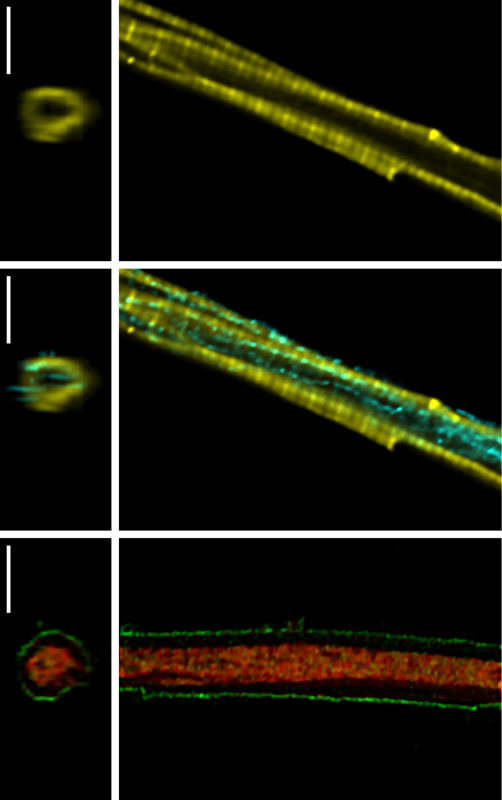 From top to bottom: the first image shows the actin filaments labelled with Atto633-phalloidin (yellow). In second image the same cell as in first, showing also the immunolabelling of tubulin (cyan). In third image, sarcolemma and mitochondria were labelled with Di-8-ANEPPS (green) and Mitotracker Red (red), respectively. Bars are 5 µm. This dissertation employed different interdisciplinary methods and approaches in order to study energetic compartmentation of cardiomyocytes and the role of adenosine diphosphate (ADP) in protection against mitochondrial permeability transition pore (mPTP) opening. New insights into aspects of intracellular ADP diffusion restrictions in cardiac myocytes are gained by using rainbow trout and guanidinoacetate methyltransferase deficient (GAMT-/-) mice as animal models. Although this work revealed the existence of diffusion restrictions in trout cardiomyocytes, the modeling results suggest different metabolic compartmentation and regulation compared to mammalian cardiomyocytes. Results show that trout cardiac cells lack the coupling between a fraction of adenosine triphosphatases (ATPases) and endogenous pyruvate kinase (PK) that was found in rat. The coupling of hexokinase (HK) to mitochondrial respiration in trout cardiomyocytes suggests that they have different metabolic regulation compared to mammalian cardiomyocytes. In addition, no coupling of creatine kinase (CK) to respiration is found. Based on the results, another explanation of diffusional restriction at the mitochondrial outer membrane (MOM) level may be proposed. This thesis considers the view that in part it might be not due to the MOM itself, but due to the close proximity and interactions between the sarcoplasmic reticulum (SR) and mitochondria. This hypothesis also may explain why mice with a disabled CK-system show near-normal function and no structural changes in energetic compartmentalization as well as mitochondrial organization. In vivo, the mitochondria-SR coupling creates the structural key basis for the optimal regulation of mitochondrial respiration, excitation-contraction coupling (ECC), Ca2+ and reactive oxygen species (ROS) signaling, thus avoiding the danger of mitochondrial Ca2+-overload and irreversible opening of the mPTP. This dissertation also demonstrates that ADP is a potent inhibitor of mPTP in severely stressed mitochondria and that this mechanism is not related to its effect on ROS production. The results imply that ADP may regulate mPTP via some other mechanism, in addition to its regulation via adenine nucleotide translocase (ANT) and reduction in ROS production. This work also discusses the physiological implications of ADP diffusional barriers considering the role of ADP in mPTP regulation.